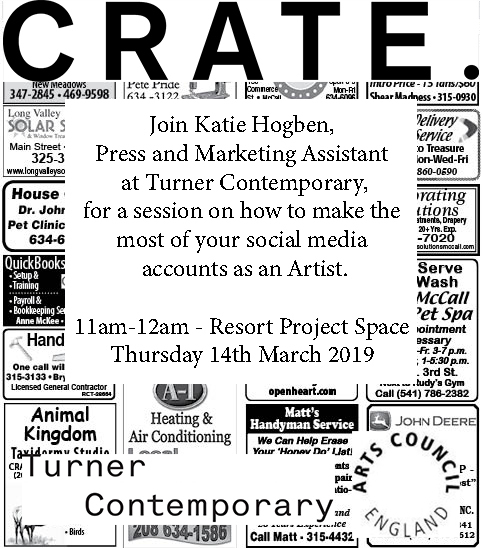 Join Katie Hogben, Press and Marketing Assistant at Turner Contemporary, for a session on how to make the most of your social media accounts as an artist. During the second half of the session you will have the opportunity for a quick 1-2-1 session with Katie to receive personal recommendations regarding your artist social media channels. Thursday 14 March 2019 11am-12pm, Resort Project Space. Please RSVP admin@cratespace.co.uk so we can get a sense of numbers.